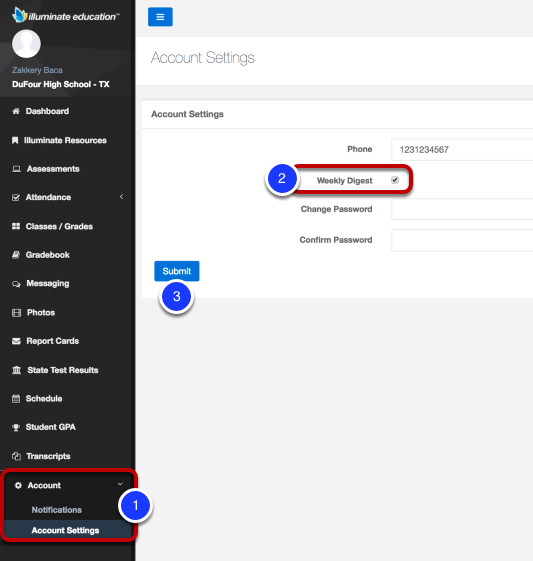 This lesson will show you how users with Portal access set up email notifications in the Illuminate Parent Portal. This will allow parents to receive immediate emails about their student's attendance, grades, etc. There are two types of notifications that are available to those who have Parent Portal access: Email Notifications and a Weekly Digest. Those with access to the Portal are able to choose from a variety of Events to be notified about as they occur. Weekly Digests are email summaries of a week's worth of information about their child(ren) delivered each Friday afternoon. This feature is only available if SwiftReach API is enabled. Please contact your Customer Success Manager (CSM) to enable this feature. Select the Event you want to be notified about. Some Events have to be set up based on your preferences and others can be saved by pressing Submit. To change or remove the notification, you must delete it by selecting the trash can icon. Once removed, the event notification can be added again. 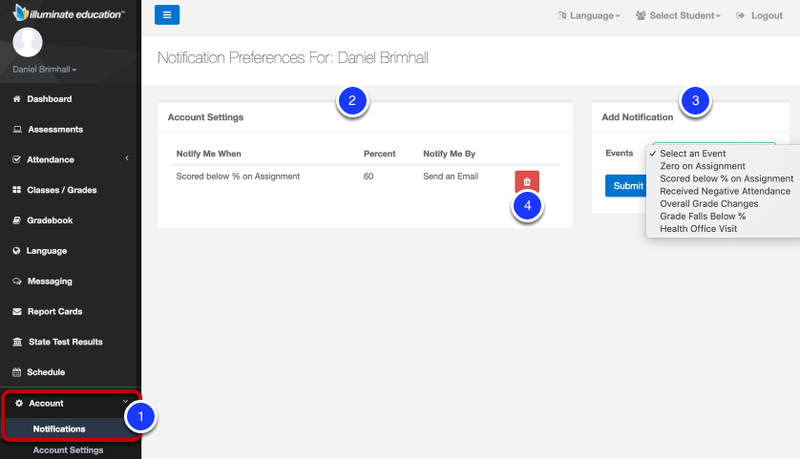 Note: All notifications are part of the user's experience about their student in the Portal and cannot be modified. Notifications need to be set for each child. 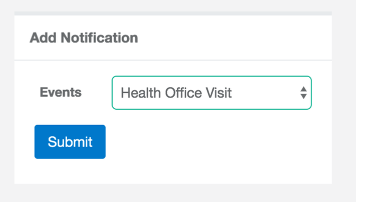 In order to receive event notifications for other children, users must switch to that child's account, and enable the event when viewing their information in the Portal. There are a variety of Events to choose from to receive email notifications. When a teacher assigns a 0 value or score to an assignment in their Gradebook, an email will be received for each assignment that the student has earned a 0, in all Gradebooks for any assignment. This can potentially trigger many emails notifications depending on how many assignments with the score of 0 they earn. When the event happens, an email will be sent to notify you of information like the assignment name and the teacher the Gradebook is from. Click Gradebook on the side navigation panel (or the Gradebook tile, not shown) from the Dashboard. Click to open the gradebook that the assignment in question is in. The gradebook title is highlighted in blue. Assignments with Zeros will show the number of assignments in the Gradebook that are marked with a 0 score. 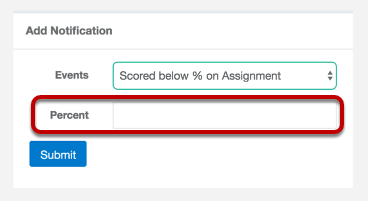 Select With Zeros in Assignment Filters to change the assignment list to just assignments with a score or value of 0. In the Assignment List, click the blue title of the assessment to learn more. Information may or may not include a description, score information, date, due date, attachments, and any other information available for the teacher to record. You will receive a notification in the event that your child scores below a particular percentage on any assignment in any Gradebooks they may be tied to. For example, in the event that your student earns less than 60% on an assignment, you will receive an email notification. 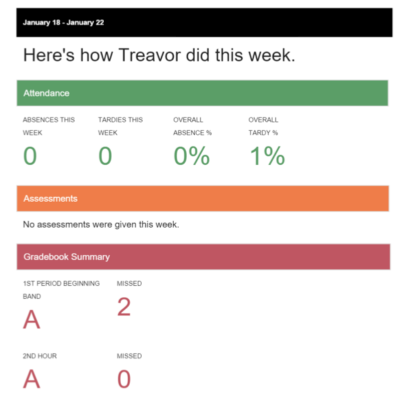 This alert currently only works for a Points-Based Gradebook where point values such as 20/25 and percentages such as 85% are the overall mark for the student. This notification can potentially trigger many emails notifications depending on how many assignments have a score less than the percent configured in all gradebooks. Once in the Gradebook, you will see the Assignment List. Click the blue title of the assignment to learn more. Information may or may not include a description, score information, date, due date, attachments, etc. You will receive a notification in the event that your child is marked with an unexcused absense or tardy. When the event happens, an email will be sent to notify you of the unverified absence, the teacher's class they were absent for, and the date of the absence. Click Attendance > Attendance Marks on the side navigation panel. Your menu will include two views of attendance information such as Year Summary and Attendance Marks. By default, the information display will be all attendance marks for all classes, but by using filters such as Type, the list of attendance marks can be changed to view Absent only. 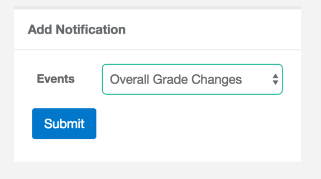 You will receive a notification in the event that the overall grade or mark your child is has in a single Gradebook changes from one value to another. For example, if your student moved from a B to A, B to D, or even a 1 to 3, or 4 to 3. When the event happens, an email will be sent to notify you of the overall grade or mark in a single Gradebook changing, as well as the most recent assignment score that contributed to the change. Once in the Gradebook, you will see the Assignment List. Click the blue title of any assignment to learn more. Information may or may not include a description, score information, date, due date, attachments, and any other information available for the teacher to record. You will receive a notification in the event that the overall grade or mark your child is marked in a single Gradebook changes below a particular percentage. This alert currently only works for a Points-Based Gradebook where overall marks are based on percentages such as 85% or 62%. This notification can potentially trigger many emails notifications depending on how many and how frequent gradebook grades change to the percentage configured. 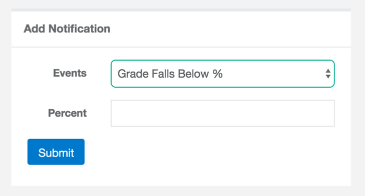 When the event happens, an email will be sent to notify you that the teacher's gradebook overall mark or grade has dropped below the percentage configured, in a single gradebook. It will show the percentage it was previously the current drop. 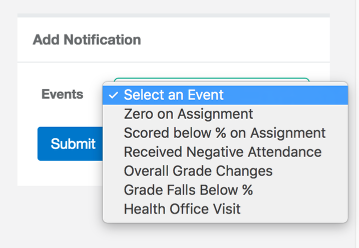 If other notifications are enabled such as Overall Grade Changes, Zero on Assignment, and/or Scored Below a % on an Assignment, it may trigger or alert you with multiple emails for each notification for you have set up. For example, if a student received a 0 on an assignment that changed their overall grade from an A to a C, and that assignment is a score less than 65%, you may receive up to 4 email notifications. Once in the Gradebook, you will see the Assignment List. Click the blue title of the assignment to learn more. Information may or may not include a description, score information, date, due date, attachments, and any other information available for the teacher to record. You will receive a notification in the event that your child goes to the Health Office. This will be sent once a Health Clerk or Nurse records information in the office log. This alert is dependent on your school site's use of the Health tools available to them. When the event happens, an email will be sent to notify you that your child visited the Health Office or Nurse, if the clerk or nurse recorded the information in Illuminate's Office Log. Additional Health information is not provided or displayed on the portal. To find out more information about the Health Office visit notification, please contact your School Site Staff, Teacher or Health Clerk. The Weekly Digest is sent every Friday at 4pm to your registered email address found in your Portal Account Information. This digest shows only information from the current week (Monday through Friday). Most information can be found in detail on your portal account, but for Behavior information, you will be directed to your child's school site for more details about any incidents that may occur. Click Account, then Account Settings. Check the box next to Weekly Digest. To see Parent-facing documentation, see the guides in Home Connection Portal: For Parents.